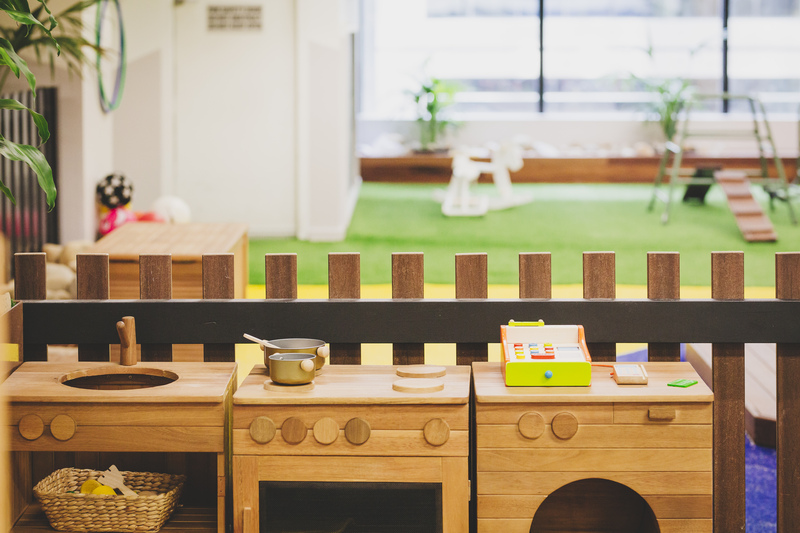 It doesn’t take a busy working parent long to count up all the ways having a preschool close to their work in the city makes life easier. For one, you don’t have to juggle early morning preschool drop-offs with racing your car back home and then catching public transport to work yourself. Outer city dwellers know that particular hell, all too well. And then there are pick-ups! How nice it would be to not be anxiously looking at the clock towards the end of each working day, praying you’re not going to be late to collect your little one. But what do they miss out on? 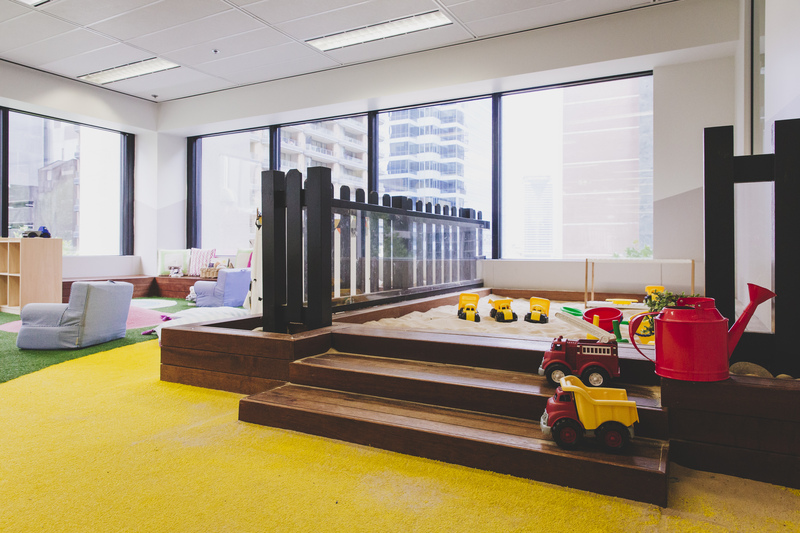 But what does it actually look like to be able to send your kids to a preschool that is in a high rise office building? And are they missing out on the joys of riding a balance bike around the outdoor play area, eating unmentionable items from the sandpit or learning about sun safety while rubbing sunscreen into their eyes (cue tears)? 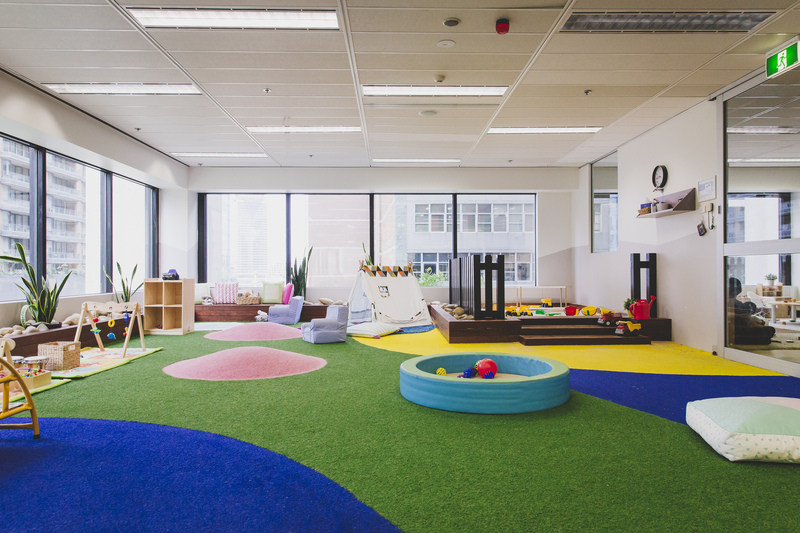 After spending a morning poking around Sydney’s Market Street Only About Children (OAC) centre, we discovered that just because a preschool is inside an office building, smack bang in the middle of a bustling capital city, it doesn’t mean your little ones go without open spaces and incredible play options. AND we have the photos to prove it! 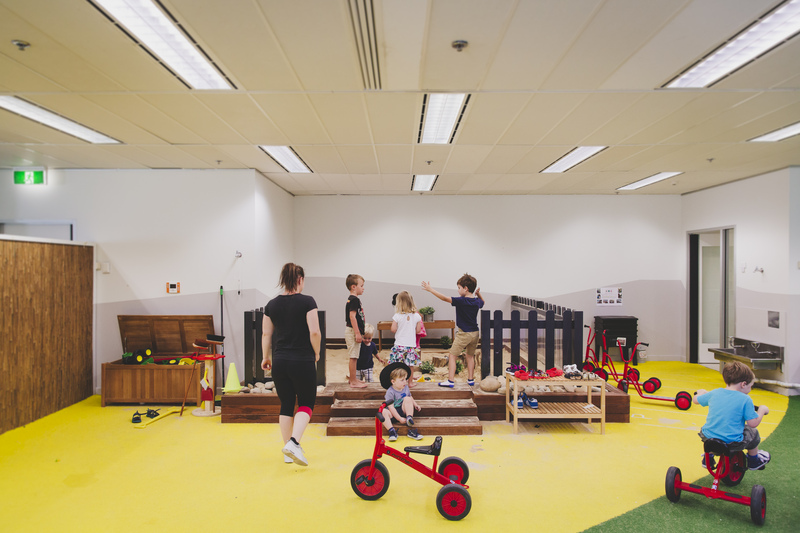 Sandpits, a treasure trove of outdoor play equipment (for the indoors) and bikes a plenty – what kid wouldn’t be happy kicking about in this playground? There is even a little wooden bridge that they can cycle over till their heart’s content. There is even a slightly more subdued area – yes, complete with a sandpit – for the younger ones. In fact, more than just one. They get to enjoy a lovely reading nook (far left) with views they are far too young to appreciate, little pink mountains to crawl or climb over, a smattering of baby play mats, slippery slides, and shaggy-maned rocking horses to prevent any injuries. Then we have the nursery “indoor” play area that is attached to the most adorable dimly-lit room full of cots and twinkling ceiling lights you will ever see. I seriously wished it wasn’t inappropriate to climb into those cots and curl up for a quick power nap. Serene is the only word to describe it. I am not exaggerating when I write that this adorable set-up is cosier and comfier than my own home. Tiny tables with tiny rocking chairs for equally tiny people make for the perfect place to have a pretend tea party – they can even get cooking in the kitchen behind the table if they feel the urge. They even have their choice of a second kitchen to cook in, this one overlooking the faux-grassed play area. 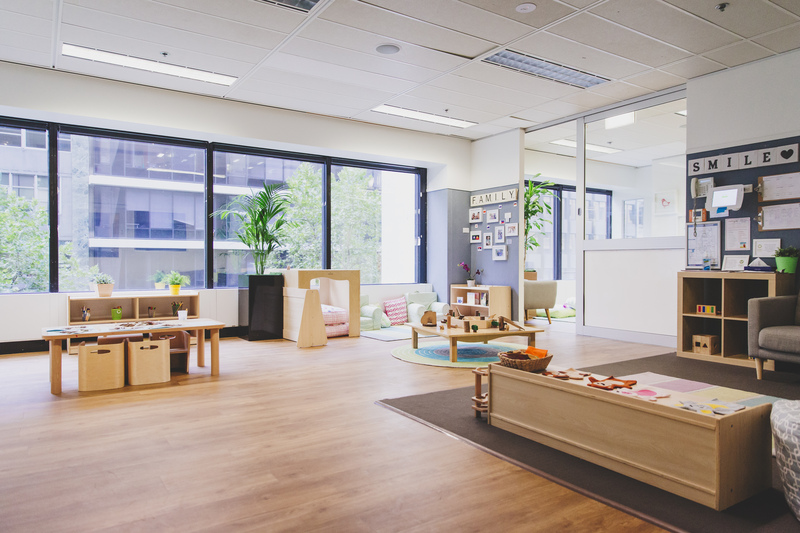 No preschool is complete without a rockin’ craft area, and this centre doesn’t disappoint. With celebrity chef & OAC nutritionist Zoe Bingley-Pullin designing the seasonal menu, you can be assured they’ll be getting a brilliantly healthy and tasty feed too. Beef Nasi Goreng, Lentil Bolognaise with Wholemeal Pasta served with a Garden Salad, and the Carrot, Date and Banana Loaf just to name a few of the delicious options! Turns out we were wrong about city preschools, kids really don’t miss out on your standard outdoor play equipment. They have thought of everything. This one truly was something special to behold – even if you’re a country dweller and will never need such a service, it sure is fascinating to see.